3 Bedrooms Upstairs and 1 bedroom downstairs sleeping up to 7 people. 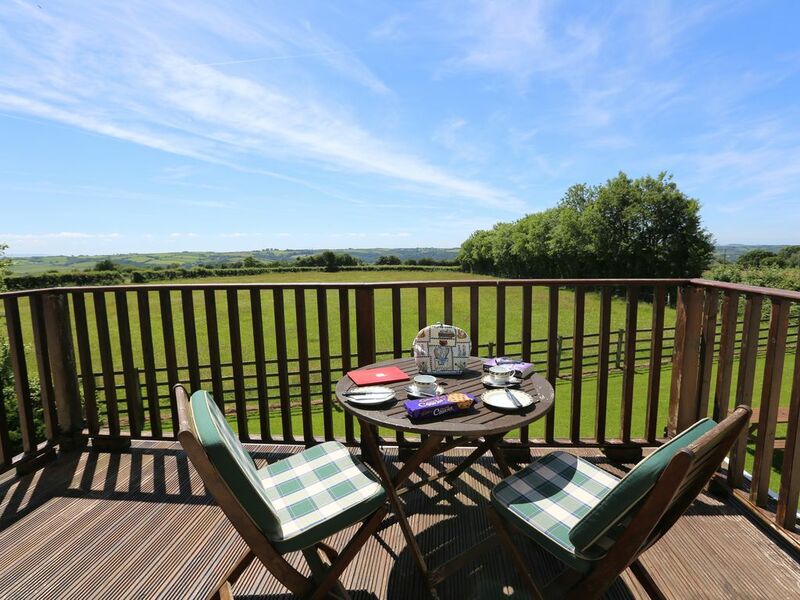 Kitchen and Lounge leading on to a balcony with stunning views is situated on the 1st floor level enjoying the benefits of views of Dartmoor and the Taw Valley. Upstairs Bedrooms - 1: Kingsize bedded room with en-suite bath and shower. 2: Twin-bedded room. 3: Single bedroom. Family bathroom with shower. On the edge of the Village is the Highbullen Golf and Country Club 18 hole golf Course, indoor heated swimming pool and state of the art fitness centre. Saunton Golf Club has two 18 hole links golf courses which are considered to be two of the best in the South West. If golfing with your host the fees are approximately £30 a head for the day. Other Golf Courses in the area - Royal North Devon , Libbaton, Portmore and Tiverton. Notes on accommodation: Included in the Tariff for each Cottage: Bed Linen with Towels Electric Cooker Fridge and Freezer Dishwasher Microwave Electricity and Central heating with radiators Washing Machine Tumble Dryer Cot and high Chair can be provided (please supply your own bedding for Cot) Colour T.V. and DVD Player Radio/CD Player Complimentary Welcome Tray on Arrival Outside: Grange Holiday Cottages are fully furnished and Equipped to a High Standard. We have secure off road parking to the front of the Properties, WIFI connectivity, An enclosed lawn area with BBQ facilities Garden furniture Enjoying stunning and uninterrupted views to the rear. There is a playing field in our Village just up the road for younger children top enjoy. This was my second visit but definitely not my last. A real home from home. Comfortable and perfect for a couple or family. Beautiful sunset views from the balcony. Don’t hesitate to book. Absolutely delightful..As close to perfect as you can get. I absolutely couldn't recommend Sunset View highly enough, I was greeted by Sue who showed me where everything is and how it works then left me in peace. The walks for the dog were ideal and safe off road walks. The property itself is beautifully clean and just like a wonderful home from home. Definitely a place to return to regularly. Thank you so much. We are very pleased you enjoyed your stay with us it was a pleasure. We hope you have arrived safely at your next port of call and enjoy the next 2 weeks hopefully your husband will soon be over to join you. Excellent accommodation with everything provided in a superb location. Great local shop with very friendly locals. Perfection would be, as far as my husband is concerned, if someone purchased the pub opposite. We are a very busy family who have gone through a hectic year to date. The setting is ideal and beautifully accommodated in a very rural setting. The village community shop and local farms sell fresh produce that we haven't seen for years in city centre shops. There are narrow country lanes for access but after a mile we were on main roads to many tourist attractions and coastal walks. Sunset View is well equipped and has lovely views from every window. Ein ruhiges Plätzchen. Ideal zum relaxen, für Ausflüge und Golfen. Sehr sauber, bemühte Eigentümer und alles vorhanden was man braucht. Absolut empfehlungswert!!!! Plenty of local footpath walks for those with dogs or ramblers who enjoy the countryside. For gardening enthusiasts on our own doorstep the well known television Gardening Expert Carol Klein approx 1 mile away where you can visit her gardens. There are many coarse fishing lakes and reservoirs available in the area. Also, we have riding schools within 5 miles of us if you fancy learning to ride. North Devon is renowned for it's excellent Surfing beaches at Woolacombe, Saunton Westward Ho! and Croyde. Clovelly, and Hartland all within 40 minutes reach by Car. NOT forgetting Lundy Island which can be visited by helicopter or boat. 2 miles away where there is free car parking and you can catch a train to Exeter and experience the beauty of the Devonshire Countryside or go the opposite way and take in the rolling hills and views as the train winds its way to the historic market town of Barnstaple. The Tarka Trail stretches from Braunton to Torrington and further is an excellent cycling and walking track with estuary and sea views with the beauty of no hills and no traffic! Explore the stunning landscapes and rugged moorland hills and tracks of Exmoor and Dartmoor. Gardening Expert Carol Klein approx 1 mile away. 12 miles away RHS Rosemoor Gardens near Torrington as well as several Garden Centres within easy reach. Also, we have riding schools within 5 miles of us if you fancy learning to ride during your stay.